That’s right, I’m talking about these last few episodes that are left of Mad Men!!! What the heck is going to happen?? And why are they screwing around with Joan? And how come Peggy always, always, always seems to just barely have a clue? And, as always: Poor Don!! Oh well. Only 2 episodes left… Then I hope they release the magnificently designed, boxed-DVD set the very next day. Anyway, it felt great to get that off my plate and officially on to the next phase of the upcoming staged reading. I have to say, I am starting to feel like this reading is going to run smack dab into me selling this house here in Ohio and having to buy a house back in New York and move. I just get the feeling that all this endless waiting I’ve been doing for so many years now is going to culminate in everything imaginable happening at once. I can just see me flying into Manhattan, attending the reading, applaud, applaud, applaud, then hop the commuter train up to Dutchess County, look at the house I have my eye on, exuberantly say “I’ll take it!! Where do I sign?” Then hop on a plane back to Ohio, take all my possessions and throw them into a dumpster somewhere, load myself and my many beloved cats into my new (used) Jeep Commander, and head straight back to happily-ever-after-ville!! Or something like that… Meanwhile, yes, I turned in the script, and all my homework is done for school (for today, anyway), I already taught my writing student this morning, so that’s done, and it is a gorgeous day here today, so I’m outta here! Thanks for visiting, gang. I hope you have something wonderful going on in your corner of the world. See ya! 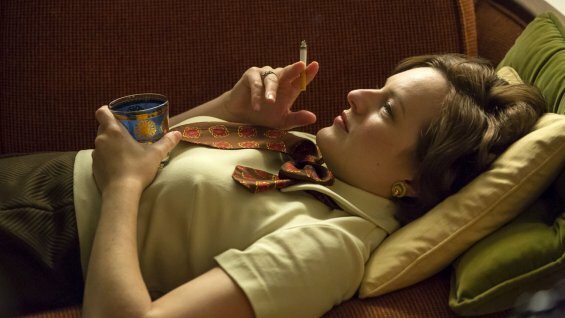 Peggy Olson is too cool!